Packed in the middle of a living room in the Columbia Heights neighborhood of DC, chamber-pop band Cuddle Magic took the spirit of their recording process on a mini-tour of intimate proportions. The line between performer and fan was blurred as the band allowed the crowd to completely surround the group, accentuating the connection to the music in every way. This is Cuddle Magic stripped away of all the electronics of 2017’s Ashes/Axis. In fact, Ashes/Axis wasn’t on the setlist at all - many of the songs are in the midst of being recorded for the new album, and what a preview it was. The harmonies stood out above all, and one person’s comment to a friend between songs said it all: “This is amazing.” Whatever form the new songs take on their next album, those that were in attendance will undoubtedly remember this intimate show for a long time to come. Ashes/Axis is out now through Northern Spy Records. 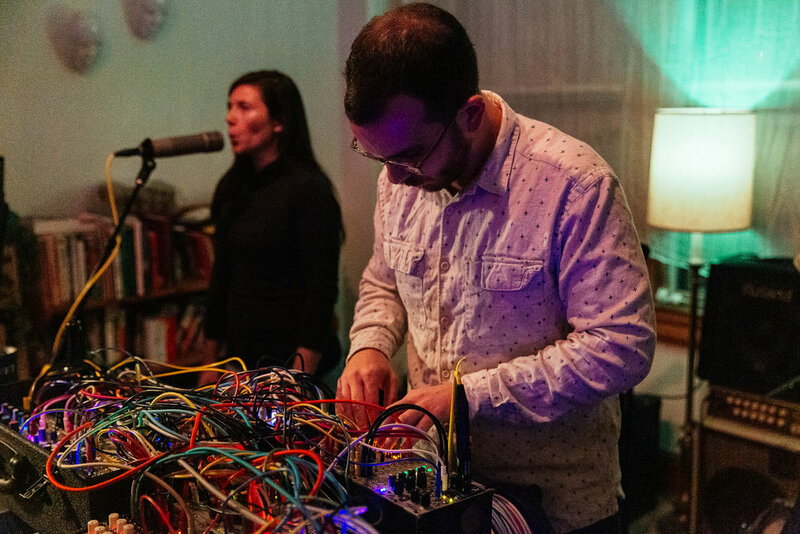 Supporting Cuddle Magic at Girard Manor were Blacklodge + em.g, the experimental modular synth project of Paperhaus’s Alex Tebeleff and Maggie Gilmore, and The North Country, a veritable indie-pop pleaser fronted by Andrew Grossman that the DMV is fortunate to have in its ranks.